It would be a major shock if Dan Soucek and Jonathan Jordan's "local" bill to deprive the town of Boone of its ETJ did not pass the full NC House today, since it has already passed a second reading. The bill may already have passed by the time this gets posted. What Soucek and Jordan have really done is nullify several elections in Boone that ratified steep slope regulations and other development rules, elections that also rejected candidates hand-picked by mega-developers, elections that made the town of Boone a progressive bastion in a sea of red and hence the object of intense conservative spite. Legislators of the Soucek and Jordan ilk -- in other words, most of the Republican crop in Raleigh -- have been dedicated to crippling North Carolina's cities by any means necessary (the stealing of Asheville's water system is but one example among many). It's a stupid and ultimately counter-productive agenda, since our cities are also our major economic engine. What new or relocating business wants to establish itself in a town with bad schools and a ravaged environment, cluttered with cookie-cutter or ill-planned infrastructure? Maybe coal-ash ponds. Legislators of the Soucek and Jordan ilk are also much into the idea of "nullification," simply ignoring or rejecting laws they don't like. Such ideological extremists do not like the land-use development rules ("zoning") implemented in cities, because development rules pinch the ambitions of people like the Templetons. The Templetons have attempted to change the rules in Boone by selecting and campaigning for their own slates for the Boone Town Council, not once (as in 2013) but twice (as in 2007, in the famous "Citizens for Change" town elections). They lost both times. Unable to win at the ballot box, they've turned to their paid puppets in Raleigh, Soucek and Jordan, to accomplish for them what they could not accomplish on their own merits and through the democratic process. Since the Tea Party take-over of our state in the elections of 2010, we've witnessed month after month such breathtaking acts of ideological extremism that have frankly beggared the imagination. Stripping Boone of its ETJ is now only the newest remarkable example of just how far this bunch is willing to go to drive our state back into a modern dark age. 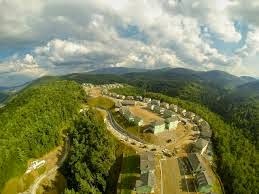 Boone is now the only -- the only -- city in the state to be singled out and treated in this high-handed and tyrannical way, all to suit the wishes of one wealthy family (and their wealthy friends). Throwing out steep slope and view shed rules on the mountains surrounding Boone was always just the first step. Getting Boone's water run up into those hills for student quadraplexes, etc. would be the next. Boone is very short on water resources for new development and has been trying to obtain a new source on the New River in Ashe County for several years. The Templetons and other mega-developers want that water, and now, without development regs in the ETJ, they will use that water to support any new North Carolina Gatlinburg that they can imagine. And -- need we say it? -- they'll use their patsies Soucek and Jordan to enact another "local" bill in the General Assembly to simply seize the water from Boone. Count on it. Therefore, Boone needs to stop spending its taxpayers' money on the acquisition of a new water resource that will be taken away to enrich the special interests operating in the largely unregulated landmass known as Watauga County. I found a map of the ETJ on the town of Boone's web site. All this time I had figured that the land out near the Food Lion was in the ETJ, but it's not. So developers are already free to try to build out in that area. I suppose the reason they haven't is because of the water. It's interesting that Jordan also introduced a bill to stop the water intake. I wonder who will win in that battle - the developers who want the water or the residents of Todd who want to stop the intake. Three guesses on who will win (and the first two don't count)! 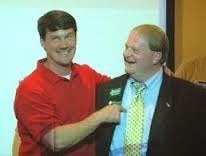 The people of Boone need to vote out #NCGOP leadership that cares only for developers. That means Virginia Foxx, Dan Soucek and Jonathan Jordan. They are some of the worst politicians I've ever seen. They are bought by developers and care nothing for voters. If Jeff Templeton is right that Boone development regulations prevented the building of a mixed use project at the old high school, how did those developers of the Scottish Inn parcel get their thing through? JW by "unintended consequences" are you referring to the unintended consequences of the View Shed and Steep Slope regulations that cost the town the ETJ, or are you referring to the unintended consequences of the Multi-Family Housing Standards that has cost the town $4 million and counting? To Jeff Templeton, we're supposed to believe your testimony was for the good of the residents of the ETJ? Anonymous, I think it is past time to vote out our Mayor, Town Council, for causing all of this mess to start with. Wake up Town of Boone government and start cooperating. I applaud the work of Dan Soucek. In what way is doing what those of us who live in town want (i.e. the will of the voters) "causing all of this mess to start with"? I suppose if you live in Todd and/or enjoy the New River in that area, this is a win. If you develop in Boone it's a loss (well and septic required). Boone should get more water from ASU as they have offered. Oh me, on my! What's a liberal to do? They could all move into that "progressive bastion in a sea of red," but that might lead to more development than the Town can handle. They could try to get as close as possible to that progressive bastion, but without the Town's restrictive ETJ rules, they may not find happiness in that "sea of red." But then there's always Vermont--or even California. "Boone should get more water from ASU as they have offered." There's no way that ASU could supply enough water for Boone's needs. Their supply is extremely limited as well.